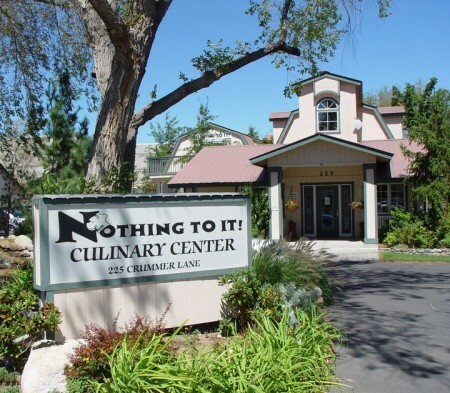 Gourmet cooking for beginners-nothing to it.. or is there? It’s no secret that I can’t cook. I can make basic grilled chicken, pasta and my Nana’s Easy Kosher Chicken Noodle Soup, but don’t expect anything fancy schmancy from my kitchen. It’s kind of a sore spot for me, not exactly something I go out of my way to brag about. This year I made a goal – not a resolution – but a goal to become more proficient in the kitchen and expand my repertoire. I’m happy to say, I’m making some progress. I’ve signed up for cooking classes at our local culinary school, Nothing To It. I’ll be embarking on an 8 week-long camp of sorts where we learn new culinary techniques each week. I’m excited to share what I learn. I’ll call this blog series: Gourmet Cooking for Beginners-Nothing To It. Because let’s face it, if I can do it anyone can. The “camp” is broken out into eight 3-hour long, hands on sessions, which are taught in a “building block” style by Lara Ritchie, the owner of Nothing To It. 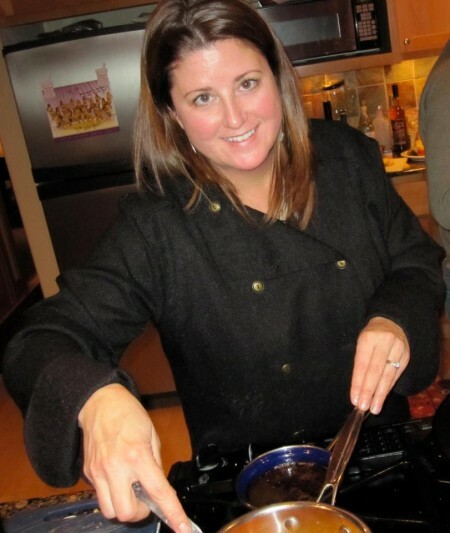 Considering she honed her culinary skills at high-end restaurants in San Francisco, Seattle and Atlanta, including the Four Seasons and The James Beard House in New York, I would say this novice is in good hands. Whether you want to learn basic techniques of gourmet cooking for beginners or you just want to hone your skills Week 1 will suit all your needs. It all about knife skills, sautéing, pan sauces and homemade vinaigrettes. And, it’s perfect for someone like me who couldn’t tell you the functional difference between a chefs knife, utility knife, paring knife or a serrated knife. 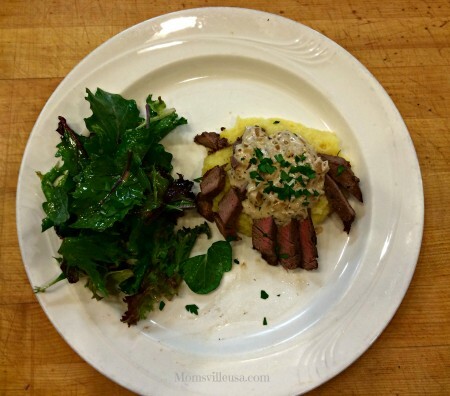 This week, I not only get to learn knife skills, but the class is also making Filet Mignon with Mustard Cream Sauce, Field Greens with Simple Vinaigrette and Poached Pears in Cookie Tuiles. I’ll share all of these delicious recipes in their own posts. In Week 2 we tackle poaching and blanching, soufflés, sauce techniques and salt tasting. This one scares me. I’ve never poached anything in my life, not even an egg. Blanching, what’s that. And soufflés…I hope mine doesn’t pop like a balloon. I’m actually looking forward to the salt tasting, which salt aficionados refer to as the simplest and perhaps most under-appreciated ingredient in kitchen. The menu for week 2 includes: Poached Chicken Breast in a Saffron Buerre Blanc Sauce with Steamed Vegetables and a Broccoli, Avocado and Pecan Salad with a Lemon Dijon Vinaigrette. In Week 3 we’ll learn butterflying knife skills and we’ll be working with potatoes, chilled soup, fruit tarts and pastry cream. Am I out of my comfort zone yet – HECK YA! But, it will be fun! The dinner menu includes: Yukon Gold Potato Pave, Roasted Red Pepper Stuffed Flank Steak, Chilled Soup and Caramelized Apple Tart. It just keeps on getting better. In Week 4 we’ll learn boning knife skills, do some olive oil and balsamic vinegar tasting, and work with tapenades, grains, braising and crème brûlée! On the menu will be: Goat Cheese Stuffed Chicken Thighs, Chardonnay Braised Leeks, Carrots and Onions and for dessert Madagascar Vanilla Bean Crème Brûlée. Ok, if I’m still making boxed mac and cheese or baking “basic” chicken for the family at this point will someone please put me out of my misery! I can’t believe there is more… four more weeks.. I’m looking forward to all of it. Winner winner not so basic chicken dinner! In Week 5 we’ll learn the most delicious way, I’m sure, for roasting poultry and vegetables. The class also covers poultry carving skills, (which at the moment, I have none,) soup basics and chocolate tasting! But wait until you see the menu: Roasted Tomato, Fennel and Tarragon Cream Soup, Roasted Red Bliss Potatoes, Lemon Rosemary Roasted Chicken and to top it all off Flourless Chocolate Cake. Week 6 has us taking a dip into Mediterranean flavors. We’ll be steaming, learning fish basics, and working with stone fruits and cakes. I’m loving this dinner menu: Moroccan Couscous Salad, Fish and Chicken Steamed with Herbs in Parchment Paper and Caramelized Plum Cake. I love how dessert is included with every menu. Although, it’s not helping me much at the gym. Did someone say cheese? By the end of Week 7 I should finally be able to go into the cheese section at Whole Foods and not sound like a complete idiot. We’ll be leaning cheese basics! But that’s not all. This session also covers broiling, legumes and beans (I didn’t know there was a difference) and crepes. The menu is just heavenly: Molasses-Glazed Broiled Cornish Game Hen, Dill and Lemon Cannellini Bean Sauté, Artisan Cheese Tasting and Crepes with Strawberry Salsa. Cooking camp finishes with Week 8, which covers frying, Asian flavors, creamy salad dressings, more sauce skills, and shortbread cookies! The menu for the last night includes: Chicken Tempura with Coconut Green Curry Sauce, Creamy Vinaigrette Salad and Pecan & Heath Bar Shortbread Cookie. 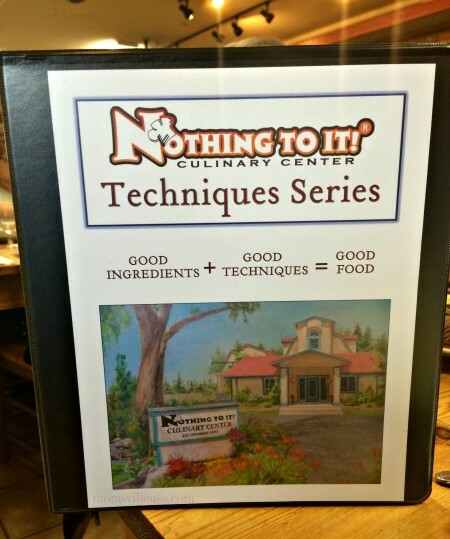 I have been wanting to take this series of cooking classes for several years. I am so excited and I can’t wait to share everything I am learning in my blog series Gourmet Cooking For The Beginner-Nothing To It. I have paid for this cooking series at Nothing To It and I am in no way being compensated for any of it. My opinions are my own. If you live in the Reno/Lake Tahoe area you might want to check out their class schedule. There’s a variety of cooking classes offered. Really – whatever your palate desires – Italian, Southwestern, Paleo, BBQ, even Sushi making, which you can read more about on the blog WindyPinwheel.